by Dimitriou, Agnes L., Sempere-Martìnez, Juan A., Sweeney, Frances M.
Dimitriou, Agnes L., Sempere-Martìnez, Juan A., Sweeney, Frances M.
Modelos, Prentice Hall's newest composition book is designed to enhance students' critical thinking and interpretive skills. Taking a highly motivational approach, Modelos asks learners to comprehend and produce Spanish in a way in which they assume responsibility and accountability for their own work. At each juncture, Modelos strives to reinforce the conviction that each student is an author, with a unique voice and individual ideas to share. A unique student-centered, holistic approach to composition, Modelos features: An integrated approach to composition covering the full process of writing, revision, and evaluation A consistent focus on language proficiency An emphasis on developing reading strategies and literary discussion A manual/workbook that includes a complete grammar review and exercises, as well as additional activities for speaking and writing, and appendices (e.g., verb paradigms, abbreviations, and ACTFL guidelines). The title Modelos plays on the meaning of authentic texts as models for writing, and the notion that students are asked assume different roles as a writer, such as: escritor fotografo (description), and escritor abogado (argumentation). 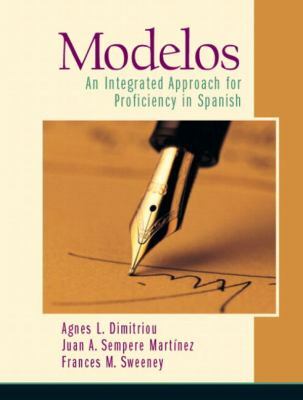 This innovative approach to composition fosters a solid and interesting next step in language comprehension and production.Dimitriou, Agnes L. is the author of 'Modelos An Integrated Approach for Proficiency in Spanish', published 2003 under ISBN 9780131893016 and ISBN 0131893017.